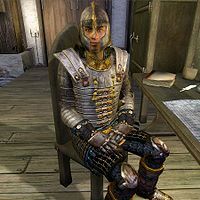 Belisarius is an Imperial Blade who resides at Cloud Ruler Temple in the Jerall Mountains north of Bruma. Belisarius works the night shift and can be found sleeping in the East Wing between 8pm and midnight. He then patrols the grounds, making a sweeping circle around the wall, stopping at the West Watch Tower on each pass. At 8am, he switches duties and begins to patrol the interior, occasionally stopping to talk with a fellow Blade in the dining area in the West Wing. He gets off duty at 4pm and will spend the remainder of his evening in the East Wing, eating and drinking. The only exception to this routine happens during the Weynon Priory quest, when you arrive at Cloud Ruler Temple with Jauffre and Martin. He will be one of the six Blades standing in line in the courtyard, ready to lift his sword and salute his new emperor. Belisarius wears a full set of Blades armor while on patrol: boots, cuirass, gauntlets, greaves, and helmet. He carries no shield, but is armed with an Akaviri katana. When he sleeps he changes into a brown shirt and light brown linens. He also carries a small sum of gold. When asked about Cloud Ruler Temple, the hard-working Blade will reveal he enjoys the comfort of a warm fireplace: "I'd have to say I'm partial to the Great Hall. On those cold nights, nothing warms your bones better than a roaring fire." This page was last modified on 8 April 2018, at 07:02.